Kramer's PixPerfect Scaling Technology - Kramer's precision pixel mapping and high quality scaling technology. Fast Fade-Thru-Black (FTB) Switching - For smooth, glitch-free switching. The output signal provides constant sync so the display never glitches. Output Resolutions - With selectable refresh rates: up to 4K UHD. Scaled Video Outputs - HDMI and 15-pin HD computer graphics. 7 Stereo Analog Audio Inputs - On 3.5mm connectors. 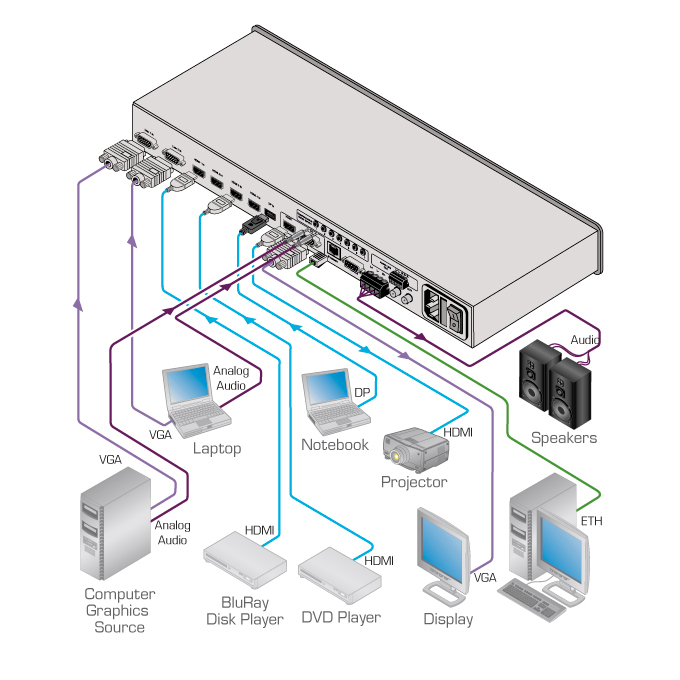 Embed/De-embed Audio - On the HDMI and DisplayPort inputs and output. Advanced Noise Reduction Features - Improve video quality by reducing artifacts such as block, chroma and mosquito noise. Powerful Audio Features - With DSP technology including audio equalization, mixing, delay and so on. Audio breakaway and audio-follow-video support, selectable audio delay. Stereo Speaker Output - 10W per channel into 8Ω, on a 4-pin terminal block connector. Built-in Video Proc-Amp - Color, hue, sharpness, contrast, and brightness are set individually for each input. Firmware Upgrade - Ethernet-based, via a user-friendly software upgrade tool. OSD (On-Screen Display) - For user-friendly control and adjustments. AP for Text Overlay Support. USB Port - For use with flash drive to download custom splash-screens and video logos and for storing/downloading the machine configurations. Non-Volatile Memory - Saves final settings and setup configurations. Flexible Control Options - Front panel buttons, IR remote control, RS-232, Ethernet with Web browser. Dimensions (WxDxH) 19" x 9.3" x 1U rack mountable. Input 4 HDMI connectors, 2 universal (composite, s-Video, computer graphics and component) on 15-pin HD connectors, 1 DP connector, 1 S/PDIF on an RCA connector, 7 unbalanced stereo audio on 3.5mm mini jacks. Output 1 HDMI connector, 1 PC (computer graphics) on a 15-pin HD connector, 1 balanced audio stereo output on a 5 pin terminal block (+4dBu nominal), 1 stereo speaker output (10W per channel into 8Ω) on a 4-pin terminal block connector, 1 digital S/PDIF output on an RCA connector. Resolutions Native HDMI, Native VGA, 640x480x60Hz, 640x480x75Hz, 800x600x50Hz, 800x600x60Hz, 800x600x75Hz, 1024x768x50Hz, 1024x768x60Hz, 1024x768x75Hz, 1280x768x50Hz, 1280x768x60Hz, 1280x720x60Hz, 1280x800x60Hz, 1280x1024x50Hz, 1280x1024x60Hz, 1280x1024x75Hz, 1366x768x50Hz, 1366x768x60Hz, 1400x1050x50Hz, 1400x1050x60Hz, 1600x900x60Hz (R), 1600x1200x50Hz, 1600x1200x60Hz, 1680x1050x60Hz, 1920x1080x60Hz, 1920x1200x60Hz (R), 2048x1080x50Hz, 2048x1080x60Hz, 3840x2160@24Hz, 3840x2160@25Hz, 3840x2160@29.97Hz, 3840x2160@30Hz, 4096x2160@24Hz, 480px60Hz, 576px50Hz, 720px50Hz, 720px60Hz, 1080ix50Hz (1080i/1080px50Hz), 1080ix60Hz (1080i/1080px60Hz), 1080px50Hz, 1080px60Hz, 1080px24Hz, 480px59.94Hz, 720px59.94Hz, 1080ix59.94Hz (1080i/1080px59.94Hz), 1080px23.98, 1080px29.97, 1080px59.94, Custom 1 to Custom 4. Controls Front panel buttons/OSD, IR remote control, RS-232 on a 9-pin D-sub connector, Ethernet. Freeze, blank and zoom, different selectable vertical refresh rates, Video and Audio ProcAmp control, output image scaling and aspect ratio change, EDID capture. Specs 100-240V AC, 50/60Hz, 49VA.